5000/1 – Just what does that mean? 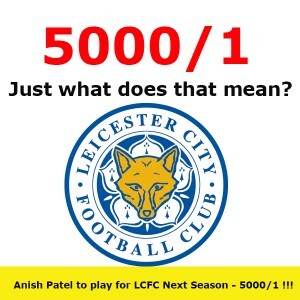 Leicester City have defied all the odds, exactly 5000 of those odds and gone on to win the English Premier League. The is the greatest achievement in the clubs 132-year-old history. But it’s hard to imagine exactly how unlikely 5000-1 odds are. This means there was a 1 in 5000 chance of this event happening, 0.02%. If you can toss a fair coin 12 times and get it to land on heads 12 times, the chances of that happening are about 4000 to 1. This might seem likely to happen but give it a try. Aliens to be found on Earth in 2017- 100/1 - To find forms of Alien life on Earth next year works out at a crazy 50 times more likely than Leicester winning the Premier League. Katie Price winning the Nobel prize in Literature – 100/1 - Celebrity Katie Price is a famous face who appears on our Television screens or in the Newspapers, having released many autobiographies she has delved into the world of literature and is 50 times more than likely to gain a Nobel Prize before Leicester win the Premier League. Simon Cowell to be the next prime minister – 500/1 - Music mogul Simon Cowell may be made famous by his X-Factor show and his Syco music label, but bookmakers made him 500/1 to be the next prime minister, a whopping ten times more likely than seeing Leicester take the Premier League trophy. Bono to become the next Pope – 1000/1 - Bono, Times Person on the year 2005. Is at 1000/1 to be the next Pope, despite his philanthropic work we can’t see him being the next Pope, but this remarkable option is still five times more likely than seeing Leicester win the League in 2015/2016! The Queen to release a Christmas Number 1 – 1000/1 - The Queen, yes you did read that right, The Queen, the Head of the United Kingdom is seemingly five times more likely to put her vocal cords to the text to release a Christmas number one rather than Leicester winning the league. Remarkable. William and Kate to have triplets – 1000/1 - William and Kate have recently had two young children in George and Charlotte and the bookmakers think they have very very little chance of having triplets so put them at 1000/1, still five times more likely to see Kate and William havetriplets than see Wes Morgan with the premier league trophy aloft. Elvis Presley to be found alive and well – 2000/1 - Conspiracy Theorists and die-hard fans have believed for a long time that Elvis may be alive and well, however with very little or no proof of a conspiracy we find it very hard to believe Elvis would be found alive. The extent of Leicester’s miracle season is still shown by the fact that their odds were still two and a half times more than those of finding Elvis alive! Eddie the Eagle to win Gold when competing in the Winter Olympic Games – 2500/1 - As we all know Eddie the Eagle is one of the most famous underdogs of all time, with very little funding, training, equipment and physical ailments which affected his sight, bookmakers put this ridiculous price on him to win Gold as he seemingly had absolutely no chance. They weren’t wrong! David Moyes to become an X-Factor Judge – 2500/1 - David Moyes is best known for his managerial exploits with Everton and most recently Real Sociedad, and the bookmakers couldn’t see the impossible happening, going from managing footballers to contestants in his category wasn’t a viable option and the bookmakers put him 2500/1, still double the chance of seeing the premier league trophy in Wes Morgans arms. David Cameron to manage Aston Villa – 2500/1 - David Cameron doesn’t seem to have a lot of time on his hands at the moment with important issues such as Brexit to contend with, so we can see why the bookmakers make him 2500/1 to be the next Aston Villa manager, with no skills or qualifications in management side of football it goes to show the extent to which Leicester shocked the world. 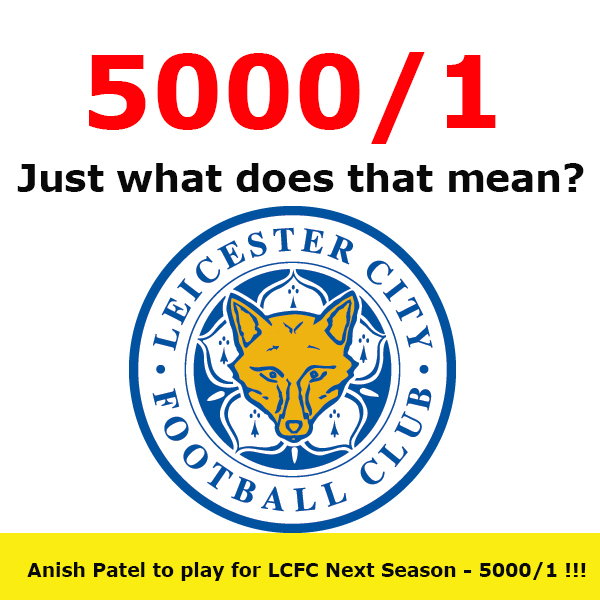 Anish Patel to play for Leicester City next season 5000/1 - We managed to find the odds of our own Anish Patel, player for Leicester City next season to be 5000/1. Do we have any takers?